SiteBuilder provides you with all the basics you could need within an interface that’s very easy to use. That’s why it’s an ideal website builder for novices or learners who want a straightforward website builder that includes hosting. Storage is not limited in any way, which is great for larger Ecommerce stores or photographers, for example, which need to watch out for, as a lot of other web builders will provide limited storage. You’ll also get a free email address when you sign up for the paid plans, with each additional email priced at $5 a month. Once you have waded through all of these promotional pop-ups, you will find that the pricing is very reasonable. They do regularly run promotions, such as 50-70% off several of the website building plans for a limited time, which lowers one plan’s price down for the first month. Normal monthly prices are as low as $9.98/month with the Ecommerce costing $24.98. These prices can drop a bit per month when signing up for the 12- and 24-month plans. $375 worth of advertising was also offered for free, which is a huge help when you’re trying to launch your site or online business. 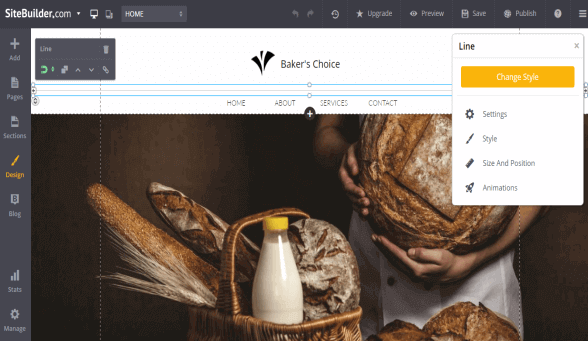 The simplicity of building a site with SiteBuilder's drag-and-drop editor translates to its Ecommerce offering as well. Those who have opted for the Ecommerce plan can set up an online store in three simple steps. The first step is to add products to your store, which you can do manually, or by using SiteBuilder's import function that lets you use a Google Sheet, Excel, or CSV file. The second step is to enter your address details, which is necessary for calculating taxes and invoicing. Thirdly, you must ensure that customers can pay you. This process is made much simpler because a PayPal account will automatically be set up on the email address used to create your Sitebuilder.com account. You can also add other payment methods in addition to PayPal. You can publish your site and your store will be active after having completed these 3 steps. A Store Page with all of your products will automatically appear in your pages menu and all of your products that you have added will have product pages that customers can click on for further information. These pages will have an "Add to Shopping Cart" button on them. Your store's shopping cart will also be accessible from your site's main header and from the header of each page. The store page, product page and shopping cart are all customizable with various design options. There’s an extensive customer support section on SiteBuilder. This features the answers to a number of questions that you may have as you start building and maintaining your site. If you can’t find the answers you’re looking for, you can email the team, chat with a representative live or call them with your questions. This service is available 24/7 with telephone support for those in the U.S./Canada, U.K. or Australia. The Top10 Hosting staff is comprised of professionals with a vast knowledge across the world of website services. Members of our international team have extensive first-hand online experience in the following: building and maintaining websites for small businesses; utilizing advanced SEO tools and strategies; developing Wordpress sites; tracking industry trends using advanced analytics tools; copywriting and editing for various online and print publications.